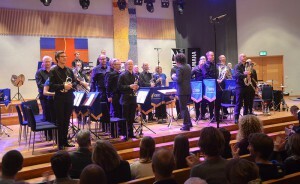 After a streak of seven consecutive titles at the Swedish Nationals, Windcorp Brass Band left last weekend’s traditional contest in Värnamo with a second place. In a tight contest with all top three bands within three points Solna Brass ended up as the new champions, delivering some solid banding throughout the weekend. With a three point lead for the Stockholm based band from Friday’s performance of set piece Chivalry by Martin Ellerby, Windcorp Brass Band’s 94 point performance of Harmony Music by Philip Sparke wasn’t enough to make it a straight eight of titles. Solna Brass played 93 points of Paganini Variations by Philip Wilby to secure the title, with 17 year old flugel player Klara Blomgren winning the Best Soloist award. Göta Brass Band as always delivered some touching piece of brass band music playing with another Sparke piece, Music of the Spheres as their own choice. Beating Windcorp Brass Band at Friday’s set piece they defended their third place from last year’s nationals with an average score of 91,5 points, one point behind Windcorp and two points behind the new title holders. Behind the top three bands Betlehemskyrkans Musikkår from Gothenburg and Uffes Blås Brass Band fought for the fourth place, delivering solid performances of own choices Diversions on a Bass Theme by George Lloyd and Kingdom of Dragons by Philip Harper. Betlehemskyrkans Musikkår managed to get one point ahead and defended their placement from last year. Windcorp Brass Band would like to congratulate the new champions Solna Brass to the title, and at the same time say that our preparations for next year’s contest already has begun to take back what’s our’s! We would also like to mention our trombone section, who for the second year in a row won the Best Section award. A big thank you of course goes to this autumn’s great conductor Tom Davoren, who despite a short amount of time with the band made some fantastic music. We hope to see you again soon! Now we look forward to getting into Christmas season mood with our Lucia Concert at the 11th of December in Gothenburg, we wish you a warm welcome to that event! Until next time, don’t forget to follow us at Instagram, Twitter and Facebook.